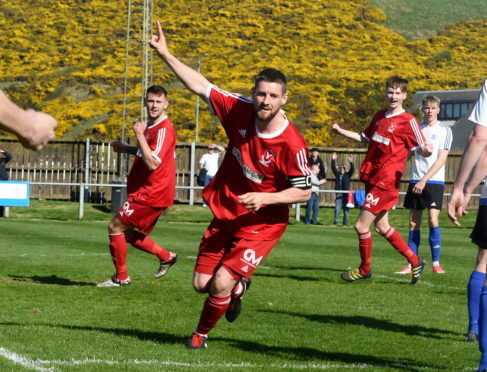 Graeme Watt celebrates his goal for Deveronvale FC against Nairn County FC at Princess Royal park, Banff. Graeme Watt, who has played for Banff-based Deveronvale FC for the 15 years, has given the volunteers in Macduff £4,000 to boost their lifesaving efforts. The money was raised during his testimonial dinner-dance that was held in February to mark more than a decade of service with his club. It will be used to buy equipment for new RNLI crew members. Mr Watt signed for Deveronvale as a teenager in 2003 and has been a regular fixture in the Princess Royal Park side’s midfield. The 31-year-old, who works in the fishing industry, decided to donate the some of the cash raised to mark his footballing milestone. He said he and his loved ones may have to rely on the services of the lifeboat crew and it was important for him to support their work. Mr Watt added: “The testimonial itself was such a surprise and the money wasn’t the number one reason for me. “So I thought I would make use of the situation and donate the money to a good cause. “The reason I chose Macduff lifeboat is my line of work as I’m a fisherman and it is an area that is quite close to home. Roy Morrison, Macduff Lifeboat operations manager, said: “As with all donations we receive here in Macduff, the money will be used locally to support our work saving lives at sea. The Macduff lifeboat, Lydia Macdonald, is unique because it is the only vessel launched from a mobile crane.